This is a splendid, and perhaps little known, building. 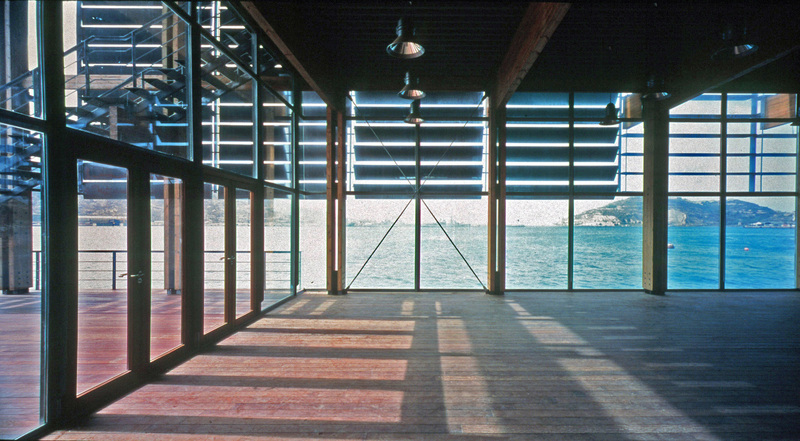 The Nautical Club in Cartagena, built by de Retes architect about fifteen years ago, is a great example of modern architecture, with radical geometry, which makes its wrapping of slats its fundamental composing argument. Inside the surrounding prism of strips, the relatively complex spatial organization moves freely creating kind spaces in the east façade and the roof. The slats have the powerful scale of the building, but generate nice interior lights. The solar protection is very effective, allowing unobstructed views at the bottom of the glazing. Thanks to the separation from the glass, the shade is enough on the south façade, but a little weak on the west one.